To say Savannah is growing is an understatement. Over the last few years, there’s been a resurgence in Georgia’s First City. With nearly 13.7 million visitors vacationing in Savannah annually and an occupancy rate of about 75 percent in 2015, the hotel industry continues to expand. 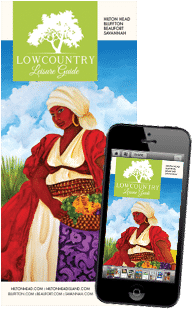 In the Savannah 2017 Economic Trends, the Savannah Area Chamber of Commerce predicted the leisure and hospitality sector keep strengthening. Rendering of The Alida hotel at 412 Williamson St. in Savannah. Photos courtesy of West Elm, not specific to Savannah property. 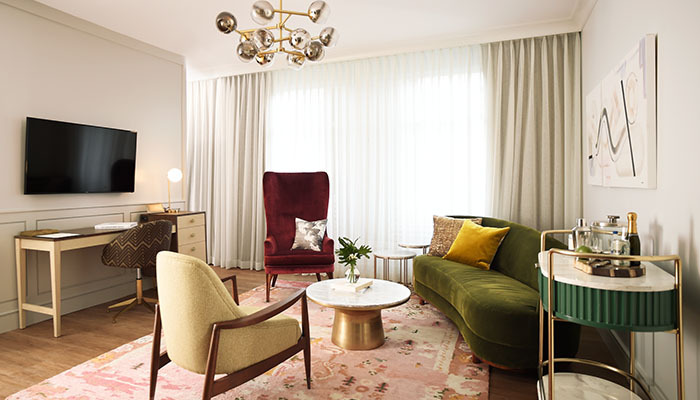 The popular high-end home accessory retailer, West Elm, is taking a dive into the boutique hotel business and with its five hotels opening in the United States is a location in Savannah. 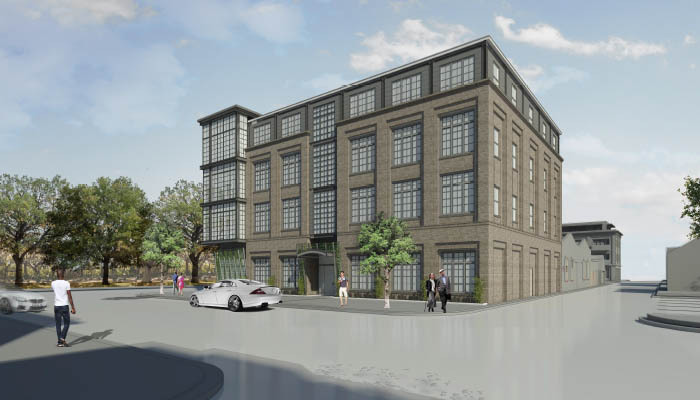 The future home of the four-story, 150- to 175-room West Elm Hotel in Savannah is at Drayton Street and East Huntingdon Street, across from Forsyth Park near the Savannah Law School. 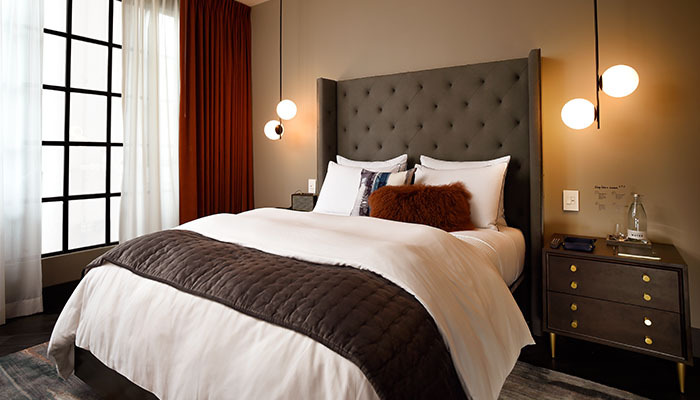 West Elm aims for each property to be unique and are in the process of discussing possible names for the properties inspired by their surroundings and history. 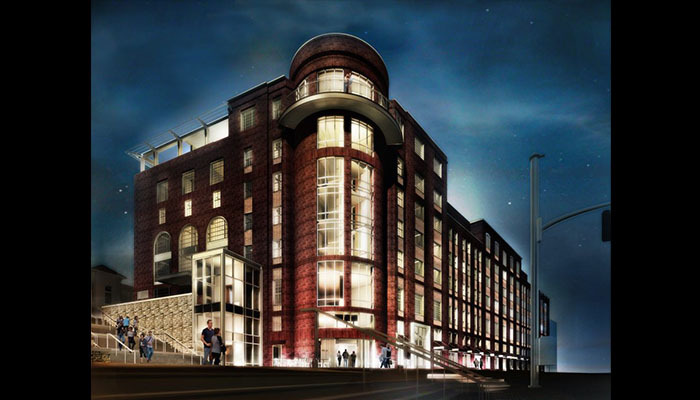 Rendering of the Aloft Hotel in Savannah. 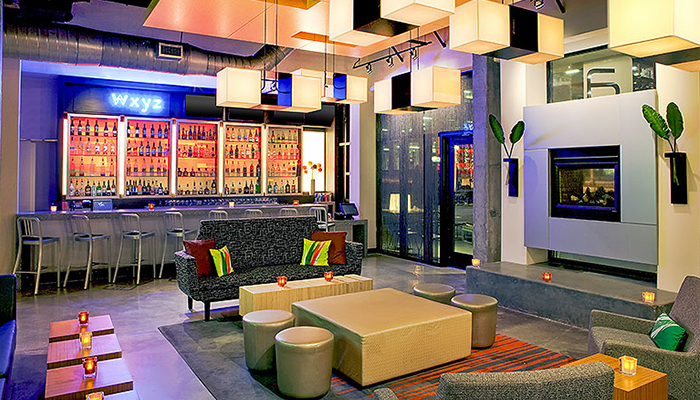 Photos courtesy of Abshire Public Relations and Aloft Hotels, not specific to Savannah property. Location: 512 W. Oglethorpe Ave. 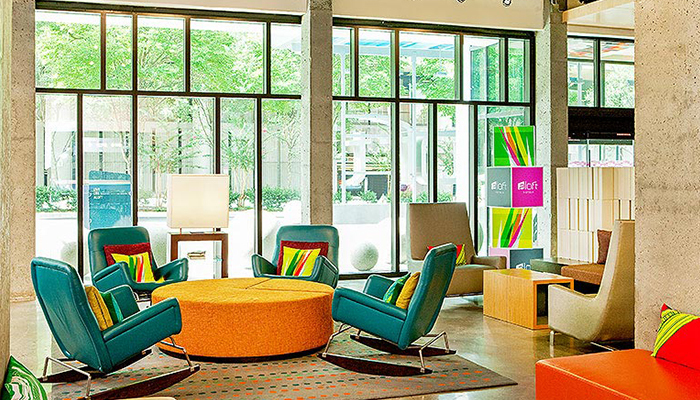 Aloft Hotels are known for their clean, contemporary architecture. With 135 rooms, this new hotel in Savannah will feature an WXYZ® bar and lounge, a grab-and-go café, not to mention a swimming pool. The pet-friendly property will even have its own mini-dog park as the brand prides itself on offering guests a modern, fresh and fun destination celebrating individuality, innovative design and style. 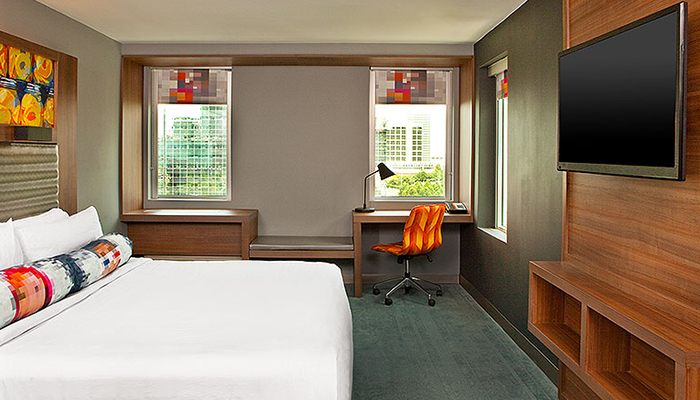 Cambria hotel & suites Chicago Magnificent Mile, courtesy of Cambria hotels & suites. 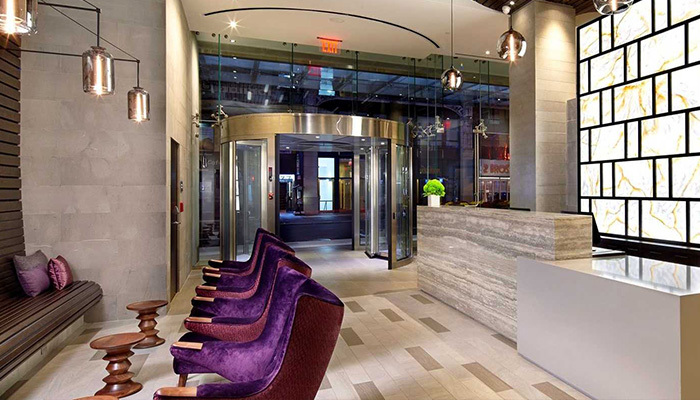 Cambria hotel & suites New York Times Square, courtesy of Cambria hotels & suites. 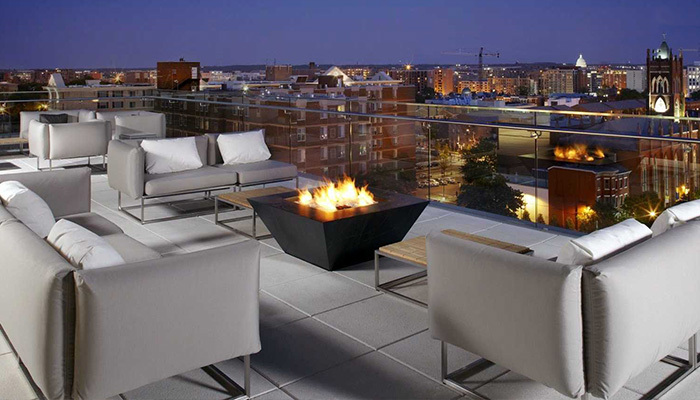 Cambria hotels & suites' rooftop bar in Washington D.C., courtesy of Cambria hotels & suites. 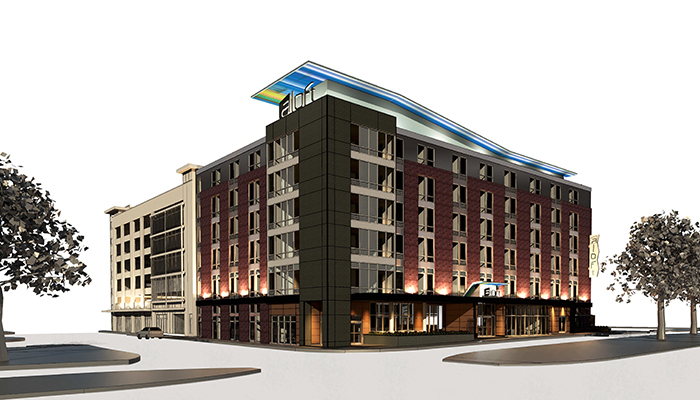 HOS Management is also working on the new 103-room Cambria hotel & suites, with the help of Dawson Architects. Cambria is known for their spacious lobbies, oversized rooms featuring flexible spaces and for boasting the latest technology, and is currently experiencing a phase of accelerated growth, with new properties under construction in New Orleans, Los Angeles, Nashville, Chicago and Philadelphia. “Expanding to a city like Savannah made perfect sense. With the growth of Savannah and our hotel’s location in the heart of the Historic District, the property is ideal for people traveling to the city on business or for leisure. It is within walking distance from world-class shopping, dining, museums and entertainment,” a Choice Hotels spokesperson said. Like other Cambria hotels & suites, the Savannah location will feature fine amenities, such as a contemporary bistro and a barista bar, as well as off-street parking with valet service. Cambria guests can also take advantage their loyalty program, Choice Privileges, which can get guests free nights and Amazon.com, Starbucks, Uber and Shell rewards earned on mid-week stays, as well as souvenir coasters and a free drink upon check-in. Rendering of the Perry Lane Hotel, courtesy of Hansen Architects. Location: 256 E. Perry St. If you’ve been to Chippewa Square, the Savannah Theatre or “Fancy Parkers” on Drayton Street, then you may have noticed the huge construction project right behind Drayton Tower. This is soon to be the Perry Lane Hotel, which will feature 168 guest rooms, a pool, meeting rooms and a rooftop events space. This boutique hotel will consist of two individual buildings and a high-end experience for visitors, with upscale dining and retail options. 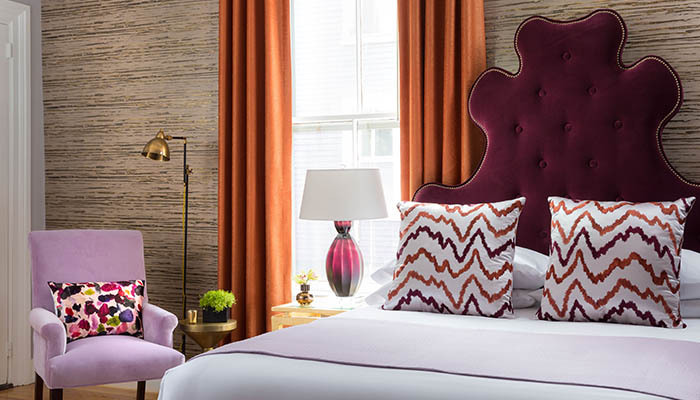 The Perry Lane Hotel will welcome guests with an airy streetscape and lobby saturated in southern flair—from the porch and parlor feel to the grand fireplaces, antiques and décor. Flank Inc., the owners of Drayton Tower, is heading the development of the hotel, working with Hansen Architects and AvroKO on the design of the hotel, while Dash Design works on the restaurant’s interior and Nine Dot on choosing and acquiring art. Rendering of The Hotel at 412 Williamson Street, courtesy of Gunn Meyerhoff Shay Architects. 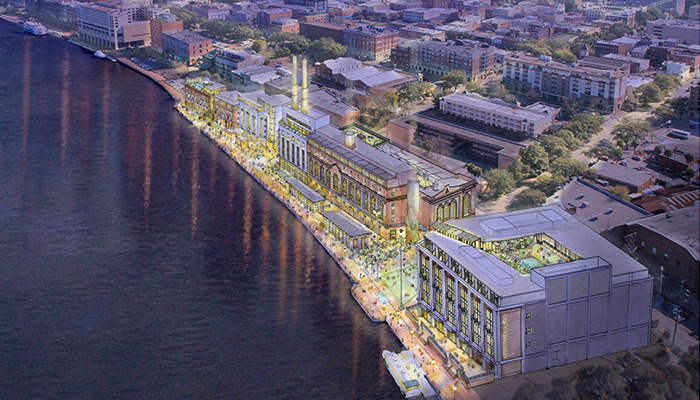 With so much popularity, it comes as no surprise that River Street is gaining its own collection of new hotels. 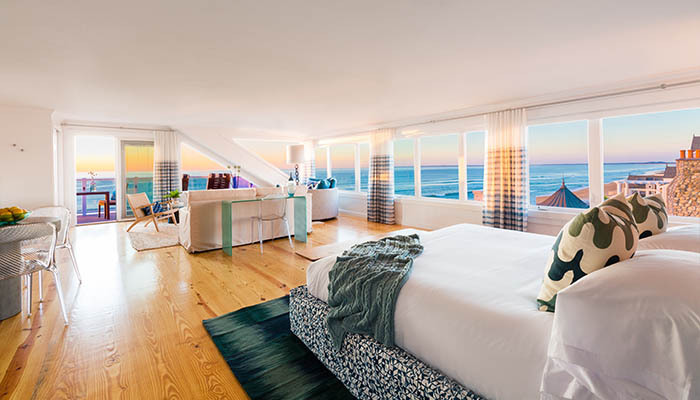 The first is the seven-story, 173-guest room property designed by Savannah-based Gunn Meyerhoff Shay Architects, which will be a part of the Starwood Tribute Portfolio. Developed by the Ohio-based Rockbridge Capital LLC, this luxurious new accommodation will span an entire block on River Street and feature 82 double king rooms, 66 kings and 25 king suites, as well as 4,000 square feet of meeting space, a signature restaurant, rooftop event space and bar, fitness area, pool and lobby bar. To accommodate this expansion of the area around West River Street, a new grand entranceway will also be built to River Street providing pedestrians with an easier, safer way to access to the riverfront. 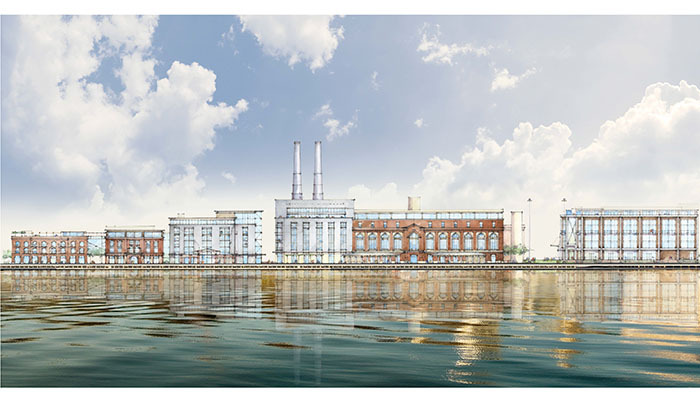 Renderings of the Plant Riverside District, courtesy of The Kessler Collection. An even larger development is taking place across the street, on the riverside of West River Street. The Kessler Collection, which also owns The Mansion Forsyth Park and Bohemian Hotel Savannah Riverfront on Bay Street, is transforming the abandoned power plant and surrounding industrial zone into a complex complete with 20,000 square feet of retail, ballrooms, meeting space and a live entertainment venue, anchored by a JW Marriott hotel. This $270 million, 670,000 square-foot development has been dubbed the “Plant Riverside District” and will be spread across five buildings. 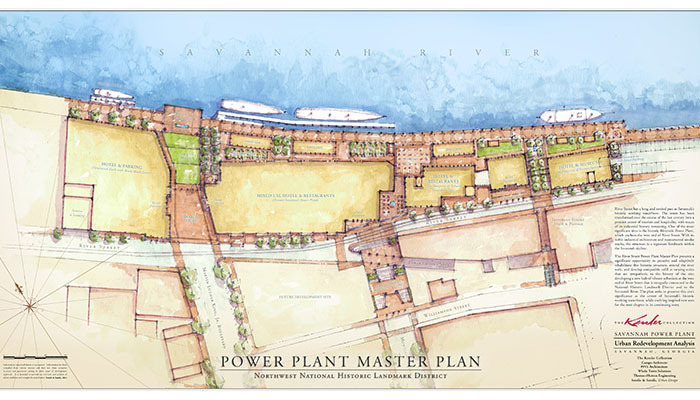 Rendering of the Plant Riverside District, courtesy of The Kessler Collection. 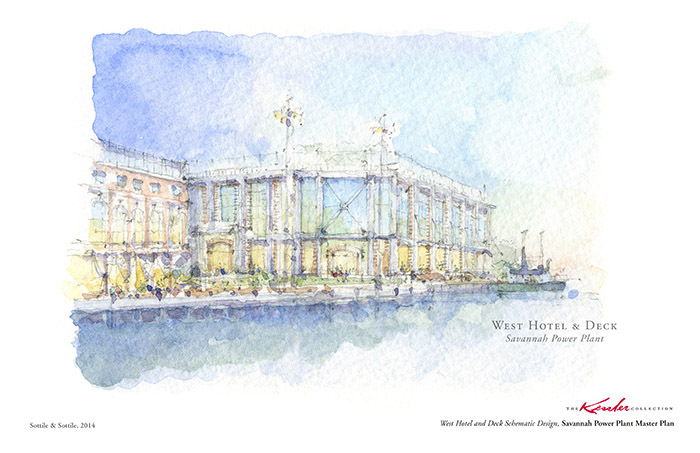 While Plant Riverside East is inspired by a natural science museum, Plant Riverside West will have a nautical theme, with sweeping views of the Savannah River. The other three buildings will have a French feel, with plush and romantic rooms. Inside these buildings, guests will find everything from restaurants and retail space to large ballrooms and concert venues, art galleries, dramatic rooftop bars and a complete expansion of the riverwalk Savannah is known for. 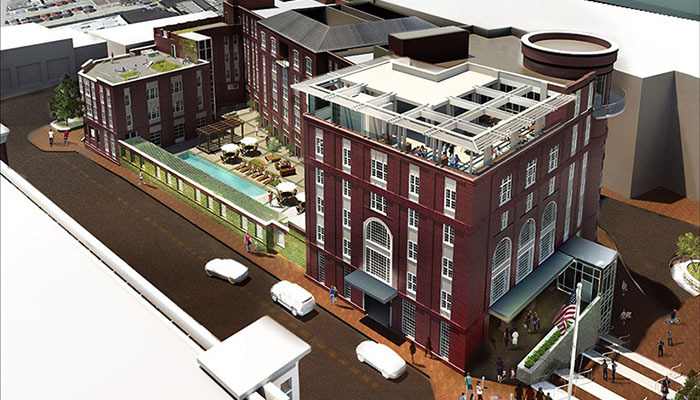 Renderings of the Lark Hotel in Savannah, courtesy of Lark Hotels. 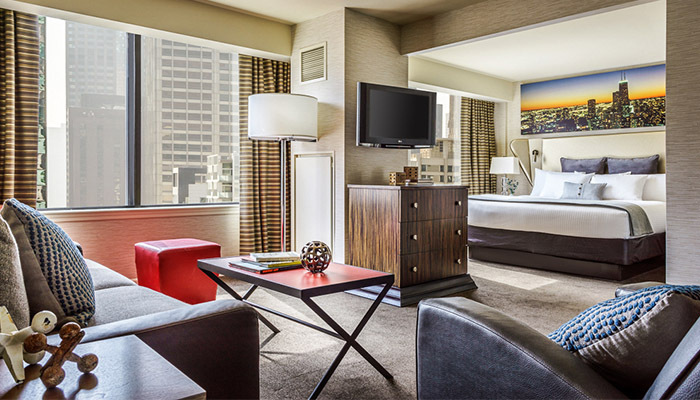 Photos courtesy of Lark Hotels, not specific to the Savannah property. 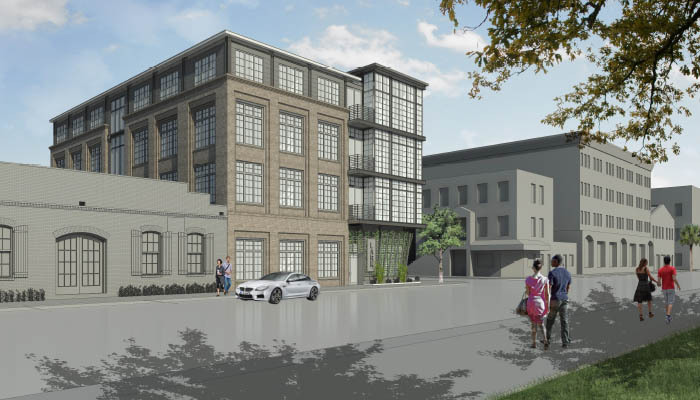 Just a few blocks away, on Bay and Habersham streets, Lark Hotels is taking on a smaller, more intimate project: a 55-room, four-story hotel with two entrances and a valet drop-off along Habersham Street. The project is bringing a much needed revitalization to this block along Bay Street with the restoration and preservation of the two adjacent buildings, which will feature an open air courtyard, lobby space and future high end restaurant. 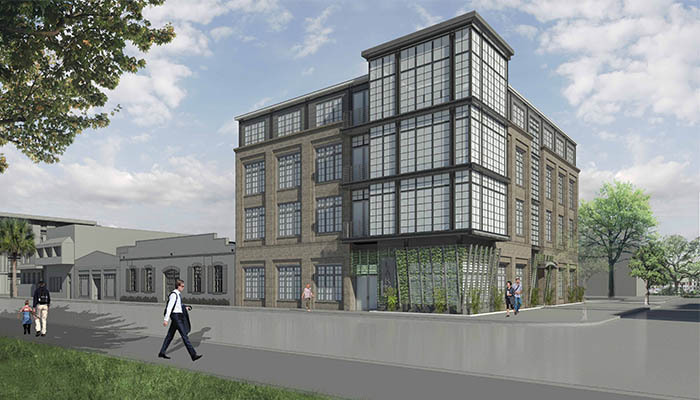 The Massachusetts-based company is making its debut in the southern scene with this new property. 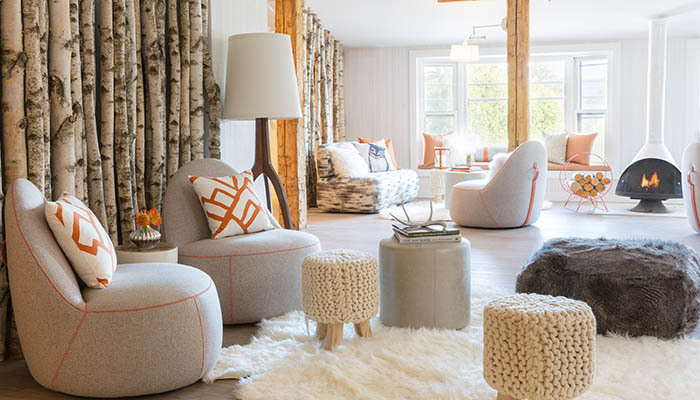 Each estate in Lark Hotels’ collection of inns in Maine and New Hampshire and boutique hotels in Massachusetts, Rhode Island and California has its own personality radiantly displayed in the design and décor, layout and name. It’s no doubt this flair will flourish in the coming hotel in the Hostess City of the South. 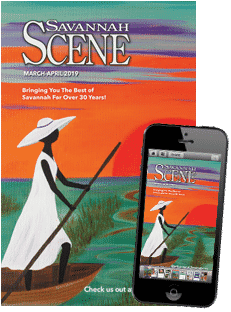 In February 2017, the Savannah Historic Review Board approved a 8,400-square-feet hotel to be built located across from the Savannah Civic Center. 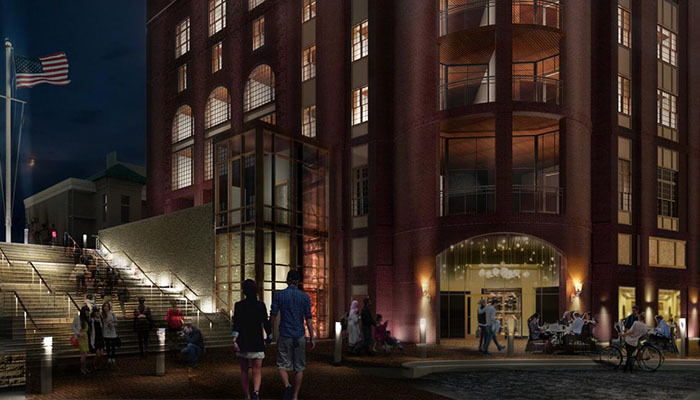 This hotel, which has been dubbed The Liberty Hotel, is being designed by Lynch Associates Architects and would sit across form Frali Gourmet and the Savannah Coffee Roasters. The projected opening is in the summer of 2019. Across town, another hotel might just be on its way to President Street, out near Truman Parkway. This past winter, Chatham County-Savannah Metropolitan Planning Commission submitted a Development of Regional Impact application to build the 645-room hotel with 685 parking space at 1147 E. President St with the help of HD Companies US Inc. of Pooler, Ga, at an estimate of $250 million. There may even be a new hotel out on Hutchinson Island in the next few years, as The Georgia International and Maritime Trade Center Authority has begun the pre-development process with Atlanta-based hotel developer Songy Highroads and Omni Hotels. This hotel will have somewhere from 300 to 500 rooms and help support and attract new conventions to Savannah.